Traditional 2-person saunas can cost thousands of dollars but now you have an alternative with portable infrared units. These not only cost much less to operate, they set up in minutes and can be plugged into any standard 110V/20 amp outlet. You’ll save money, time and space, and get all the benefits of a traditional wet/dry sauna plus the benefits of Far Infrared Ray (FIR) technology. We took a look at some of the leading 2-person saunas on the market ranging from $1100 to over $4000. 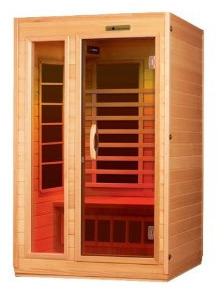 One of the more popular and best-looking units is the Dreamline Deluxe 2-Person Infrared Sauna (DLSIH-02G), which is also listed at $1999. It offers a full size glass door, 5 high quality ceramic heating elements, CD/AM/FM Stereo, digital controls, recessed interior lighting, ceiling vent, and towel rack. The WaterStar Infrared Portable Sauna at $1088 is the least expensive model among 2-person saunas and it warms up quickly — just 10 minutes. This is a solid hemlock fir sauna with 5 pure ceramic far infrared heaters. The most expensive of 2-person saunas is the Vitra Far Infrared Sauna at $4300. The Vitra unit is different in that it seeks to overcome the problems with placement of the infrared emitters which are most effective when aimed directly at the front of the body. The Vitra has five emitters; four are 350 watts, and the fifth is 250 watts. There are two emitters in the back wall, and the side wall emitters are adjustable; simply move them forward and tilt them back at an angle to direct the FIR directly at the bodies of both bathers. Whatever amount your budget for your home unit you’re bound to find something that suits you in any one of these 2-person saunas. 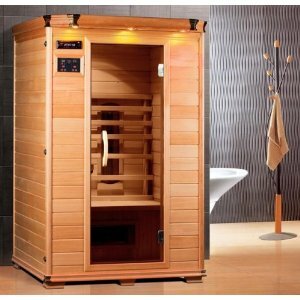 We recommend these units as the best way to get an attractive home infrared sauna cabinet at an affordable price.